We love to think of this particular summer, for Lilavate Singh was with us. The thought of her always brings help and inspiration. One day she prepared for the crowd of us a tiffin of delicious Hindustani food. That afternoon while we were sitting under the shade and fragrance of the deodar trees, we praised the tiffin. Before we knew it we were planning a cook book. It was to be a joint affair of Hindustani and English dishes, and Miss Singh was to be responsible for the Hindustani part of it. Our enthusiasm grew. For three or four days we talked of nothing else. We experimented, we planned; we dreamed, we wrote. But alas! other things soon thrust themselves upon us, and our unfinished cook book was pigeon-holed for years and years. And it is not now what it would have been if finished then. 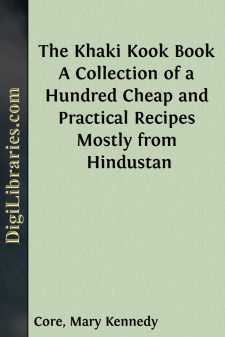 Many of the recipes, however, are those that Miss Singh gave us then. Some of them she might not recognize, for they have become quite Americanized, but they are hers nevertheless, and I hope that you will not only try them and enjoy them, but that they will help you to solve some of the problems of living and giving which are confronting us all these days. I have told this story before, but it fits in well here. A lady in India once had an ayah, who from morning until night sang the same sad song as she would wheel the baby in its little go-cart up and down the mandal or driveway; as she would energetically jump it up and down; as she would lazily pat it to sleep, always and ever she could be heard chanting plaintively, "Ky a ke waste, Ky a ke waste, pet ke waste, pet ke waste." The lady's curiosity was aroused. The words were simple enough, but they had no sense: "For why? For why? For why? For stomach! For stomach! For stomach!" wailed the ayah. "This is the meaning, Oh mem sahiba," said the ayah: "Why do we live? What is the meaning of our existence? To fill our stomachs, to fill our stomachs." You may smile at this and feel sorry for the poor benighted Hindu, who has such a low ideal of the meaning of life, but after all we cannot ignore the fact that we must eat, and that much as we dislike to acknowledge it, we are compelled to think a great deal about filling our stomachs. This is especially true these days, when prices have soared and soared and taken along with them, far out of the reach of many of us, certain articles of food which we heretofore have always felt were quite necessary to us.